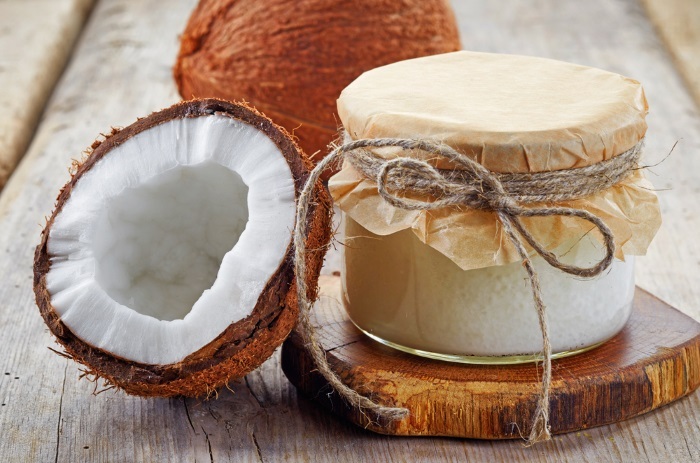 In the natural beauty world, coconut oil has become a star. Recommended by top models and celebrities, each jar of this sweet-smelling skincare staple contains a range of healthy uses. Whether you’re looking for an effective moisturizer, want to keep your face looking youthful, or seeking relief from a skin condition, coconut oil can lend a helping hand. And best of all, there’s a growing body of scientific evidence to support the benefits of its use. 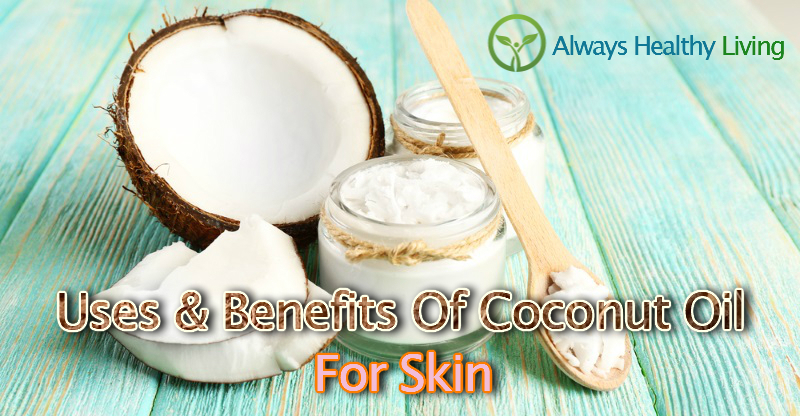 In this article, I’ll show you the uses and benefits of coconut oil for skin. Then I’ll demonstrate how you can get started using it in your daily skincare routine. 1 What Is Coconut Oil? 1.4 Is Coconut Oil Good For The Skin? Coconut oil is extracted from mature coconuts that are produced by the coconut palm, Cocos nucifera. The coconut palm is found in over 80 countries, largely in the subtropical and tropical areas of the world. The oil has been used extensively in these regions for food, health, and industrial purposes for many years (1). And these days has also found popularity in the western world for its perceived health and beauty benefits. The majority of commercially available coconut oil today is made from copra, the dried meat of the coconut. The oil that’s extracted from copra is called RBD coconut oil (refined, bleached, and deodorized). It has to be refined to make it suitable for consumption because the drying conditions of the copra are generally not sanitary. High levels of heat are used in the deodorizing process, and it’s usually bleached to get rid of impurities. Chemical solvents are often used to extract the oil from the copra in order to maximize the yield. This refining process results in an oil that loses some of the beneficial phytonutrients that it contains. Which is why, for use on the skin, it’s generally considered best to use an oil that’s unrefined and still retains all of its beneficial nutrients. This is where virgin coconut oil comes in. 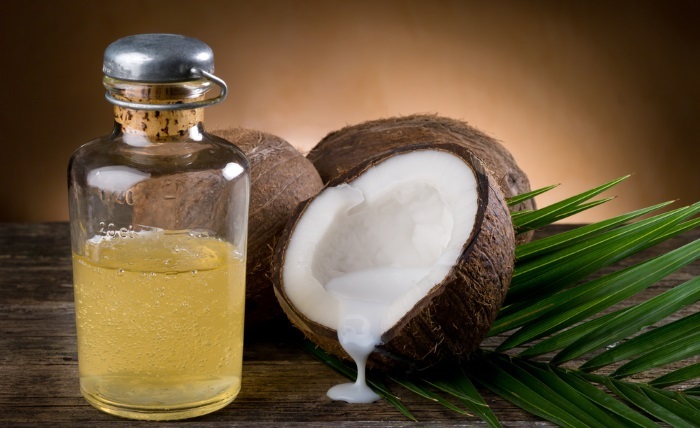 Virgin coconut oil is extracted from fresh coconut meat (non-copra) with no use of chemicals or high heat. First the outside husk of the coconut is removed. Then the shell is removed. Next, the brown layer (testa) between the shell and the kernel is peeled away. Now, the kernel of the raw coconut is ground and then dried for 2-3 hours. The temperature has to be no higher than 45 C for the oil to be classified as raw. The oil can then be squeezed from the dried meat using a cold press expeller. Finally, a filter press is used to remove any leftover sediment. You can also purchase extra virgin coconut oil for skin. But this is just marketing terminology and the product is the same as the virgin oil. The composition of coconut oil is 99% fatty acids with a very high saturated fat content. Almost half of the oil consists of lauric acid, with myristic, palmitic, decanoic, and caprylic acids being other saturated fats that are present in lesser quantities. Also present are the monounsaturated fatty acid oleic acid, and a very small amount of polyunsaturated fats. Coconut oil also contains vitamin E, phytosterols, triterpenoids, and phenolic compounds in small quantity. Is Coconut Oil Good For The Skin? Coconut oil is a popular oil with a number of beneficial uses when applied to the skin. It can be used for beauty purposes for its anti-aging and moisturizing properties. And it also has a potential use in the treatment of a variety of skin conditions, and an ability to help heal wounds and burns. Because of the popularity of coconut oil for skin care, it’s become a widely used oil in the beauty industry. And these days can be found in a range of commercially available products including moisturizers, eye creams, body lotions, and shampoos for the hair and scalp. Coconut oil is a great moisturizer that prevents the loss of water through the skin and helps to keep it looking plump, soft, and well hydrated. The fatty acids it contains are absorbed across the skin’s surface where they form a layer that helps to improve skin barrier function (2). Studies have confirmed its ability to hydrate the skin and improve areas of dry, itchy, and scaly skin (3). Coconut oil contains a number of antioxidants including the phenolic compounds p-coumaric acid and ferulic acid (4). These are ingredients often found in expensive skin care products because of their ability to prevent free radical related damage. A significant amount of the age related damage that appears on your skin is caused by free radicals that are generated after exposure to UV light from the sun, and various toxins in the environment. This damage affects the structural proteins collagen and elastin causing them to weaken and lines and wrinkles to appear. Coconut oil also provides direct protection from the sun by blocking UV rays. Studies have suggested that it has an SPF of about 8 (5). However, it shouldn’t be used in place of a sunscreen as the photoprotection it provides is only modest. While no clinical trials have been conducted to examine the effectiveness of coconut oil for treating acne, there are many anecdotal reports by people who have used it to successfully clear up their skin condition. What we do know about coconut oil provides a possible explanation for these results. 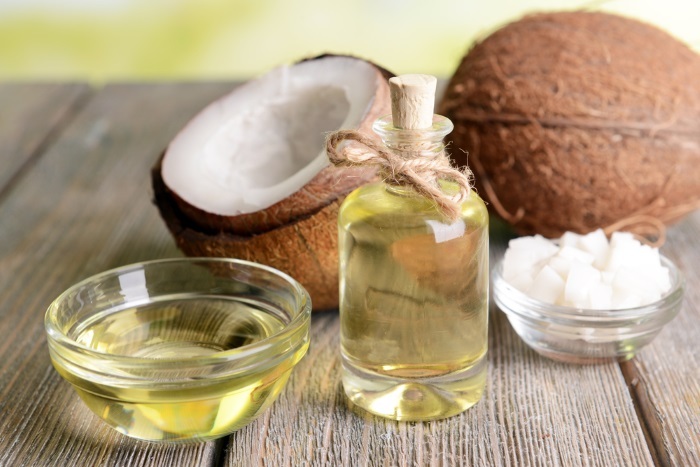 The fatty acids that largely comprise coconut oil, lauric acid, capric acid, and caprylic acid, all have scientifically proven antibacterial properties. Studies have shown that both lauric acid and capric acid can kill the acne-causing bacteria P. acnes. These fatty acids have also shown anti-inflammatory properties when acting against acne infection (6, 7). The antioxidants it contains could also help with the prevention of acne. Topical antioxidants are thought to be of use in preventing the development of acne because oxidative damage caused by free radicals to the sebum in the skin’s pores is considered to be an important step in creating the conditions for the bacteria to thrive. Evidence suggests that coconut oil could provide effective relief from eczema. As mentioned above, the ability of coconut oil to moisturize and clear up areas of dry and itchy skin is well documented. And recent studies have also demonstrated an ability to improve the condition of a type of eczema, atopic dermatitis. In one study, patients treated with virgin coconut oil showed an improvement in skin moisturization, with 95% showing the eradication of the colonizing bacteria Staphylococcus aureus (8). This is important, as the presence of this bacteria has been found to cause irritation of the skin in eczema patients and directly correlates with the severity of the condition (9). Coconut oil is a potential natural treatment for psoriasis that’s been the subject of a lot of discussion in recent times. As yet, there aren’t any studies to confirm its effectiveness. But there are many anecdotal reports from people who claim that it provides relief from the condition (12). This might be due to its known anti-inflammatory and moisturizing properties. A number of studies on animals have indicated that coconut oil may help to heal wounds when it’s applied to the skin. 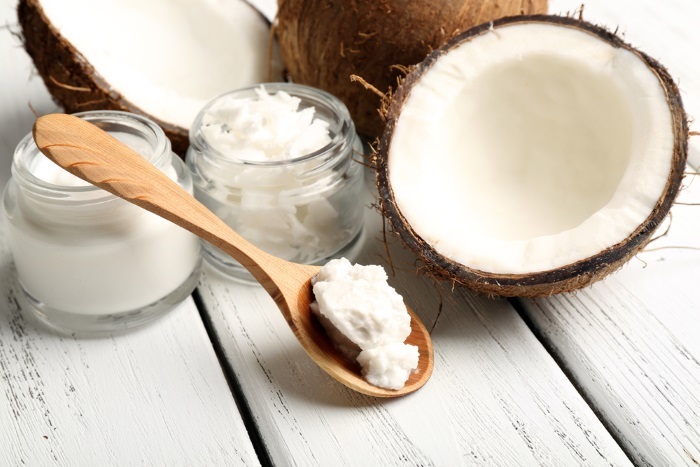 In one study on rats, treatment with virgin coconut oil resulted in faster healing of wounds, increase in collagen production at the wound site, increased fibroblast activity, and increased enzymatic antioxidant activity (13). In another study, burn wounds were significantly improved with the final conclusion being that coconut oil is effective as a burn healing agent (14). If you have been enjoying yourself in the sun for too long and your skin is red and burnt, coconut oil can help to provide some relief. It’s moisturizing and anti-inflammatory properties can soothe the skin and reduce the itchy and painful sensation. Sunburn can continue to get worse as further damage occurs for many hours after you’ve come out of the sun. But coconut oil contains vitamin E which can minimize the formation of sunburn cells. In addition to being antibacterial, the fatty acids in coconut oil also have antifungal properties. Although the majority of fungal infections are only small, they can sometimes get out of hand on the face where they can look unsightly. And both ringworm and yeast infections start out small, but can flare up and become a bigger problem on various parts of your body. In one study, virgin coconut oil was shown to be more effective at killing yeast than the commonly prescribed antifungal medication fluconazole (15). With a bottle of coconut oil you can consider getting rid of some of your chemical based beauty products. Because of its amazing moisturizing, antibacterial, and antifungal properties it makes an effective cleanser for your face. It easily removes excess oil, dirt, and bacteria. And it works as a makeup remover too. Even with difficult to remove eye makeup like waterproof mascara. Coconut oil can be used as a natural alternative to shaving cream. Its moisturizing and anti-inflammatory properties soothe the skin and help to prevent irritation, razor burn, and dryness. With it’s combination of moisturizing, anti-aging, and skin protective properties coconut oil makes a good massage oil for use on the body. You can enhance it further by adding 5 drops of rose oil (or your favorite essential oil) to 1 tablespoon of coconut oil to give it a relaxing scent and skin rejuvenating properties. If you suffer from dry and chapped lips then consider using coconut oil as a natural lip balm. Its ability to help the skin retain moisture will keep your lips looking and feeling soft, smooth, and kissable. You can use coconut oil on its own to take advantage of the benefits listed above. However, it’s also a carrier oil that can be used in combination with other natural ingredients such as essential oils to make facial masks and scrubs. 1. First of all, purchase a jar of organic, virgin coconut oil. 2. Make sure that you have washed your face. 3. Depending on the room temperature, coconut oil will be either a solid or a liquid. 4. If it’s a solid then take a small amount between your fingers and gently rub it until it starts to melt. 5. Rub the oil into your face with your fingers using gentle circular motions. 6. Use a cotton ball to remove any excess on the skin. 7. Use in the morning, or leave on your face overnight by applying before bed. 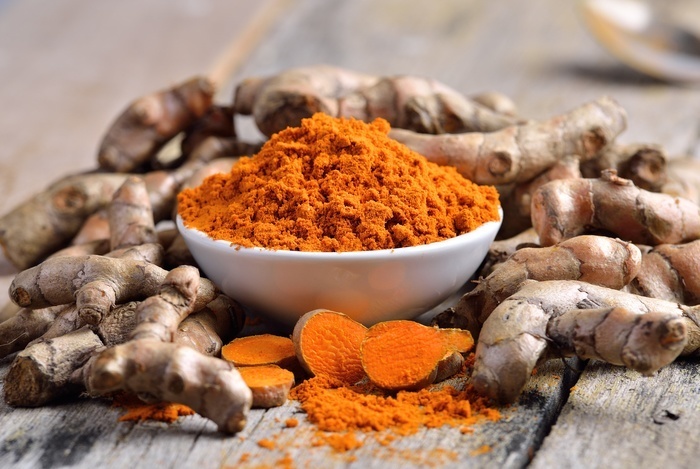 Turmeric contains curcumin, a polyphenol with strong antioxidant, anti-inflammatory, and antibacterial properties that has been shown in studies to kill the acne bacteria. 1. Get a jar of turmeric powder and a jar of virgin coconut oil. 2. If your coconut oil is a solid then gently warm 3 tablespoons in a small pan to melt it. 3. Put the coconut oil into a small bowl. 4. Take ½ a tablespoon of the turmeric and add it to the bowl. 5. Use a fork or spoon to mix the ingredients together into a paste. 6. After washing your face, apply the mixture using your fingers. 7. Leave it on the skin for approximately 15-20 minutes before washing it off. 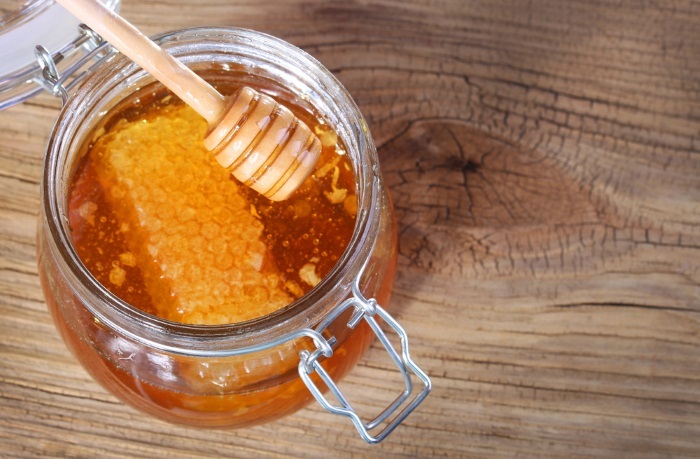 Honey has anti-inflammatory and antibacterial properties, and gently exfoliates the skin making it smooth and soft and reducing the appearance of fine lines. 1. Get a jar of raw, organic honey and a jar of virgin coconut oil. 2. Put 4 teaspoons of the coconut oil into a small bowl. 3. Add 3 teaspoons of honey into the bowl. 4. Mix the honey and coconut oil together. 5. Spread the mixture on your face with your fingers. 6. Wash the mixture off after 15-20 minutes. Before using coconut oil on your face or other large skin surface for the first time, it’s best to test a small amount of it on your wrist to make sure your skin reacts okay and that you don’t have an allergy. Leave the oil for about 20 minutes and observe any irritation that occurs. Coconut oil has a 4 out of 5 rating on the comedogenicity scale. This means that it could block your skin pores, which is of particular concern for people with acne and oily skin. But, the comedogenicity scale is just a guideline and not a completely accurate assessment of your chances of having a problem. Many people use coconut oil successfully and swear by it, including people with sensitive skin. But some people do have a problem with it. If you notice your skin breaking out when using it then you should immediately stop using it. Can you use coconut oil for stretch marks? There’s no scientific evidence to support the use of coconut oil for stretch marks. However, there are anecdotal reports from people who claim it has helped their appearance. Is coconut oil good for dark circles? Under eye dark circles can be caused by a variety of factors, including tiredness, thinning of the skin, pigmentation, dry skin, and more. Coconut oil could help with some of the causes, but most of the time it’s unlikely to have much effect. Is coconut oil good for dark spots? Some people claim that it can be used for skin lightening and to reduce areas of hyperpigmentation and dark spots. It’s thought to be of use because of its vitamin E content. Topical vitamin E can lighten dark spots because of its ability to inhibit melanin synthesis. But whether coconut oil is good for this purpose remains to be seen as there are no scientific studies to prove its effectiveness. The same applies to skin whitening. Is coconut oil good for skin rashes? I can personally attest to the effectiveness of coconut oil for psoriasis! I had a nasty patch on my knee – 1.5″ square, very bumpy, painful, and noticeable. The steroid-based cream from the dermatologist was very helpful, but it could only be used for 2 weeks at a time, it left the skin discolored, it never completely got rid of it, and the outbreaks always came back. After yet another 2-week treatment with the steroid cream, I started putting coconut oil on the patch. After 2 weeks, there was no need for the prescription cream. I just kept using the coconut oil – not only did the nasty patch completely go away- it has not come back in two years and the skin isn’t even discolored…I have not used the steroid cream once in all that time…it’s like the psoriasis never existed!! !